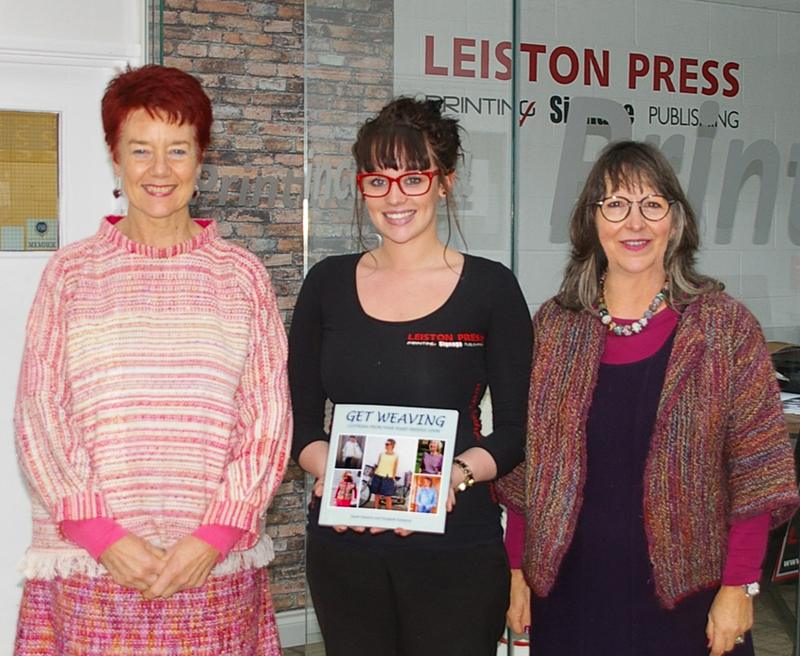 Sarah and I used our local printers, Leiston Press in Suffolk to help us publish the book. Here is Annie, our wonderful graphic designer who guided us through all the pit falls of putting our photos into print. We started in January and finished in December so it was a very full on year of weaving, writing and experimenting. We really hope you like the results and will feel inspired by the glorious colours to have a go and think about making some of your own clothing from start to finish. Here are a couple of examples from the book. 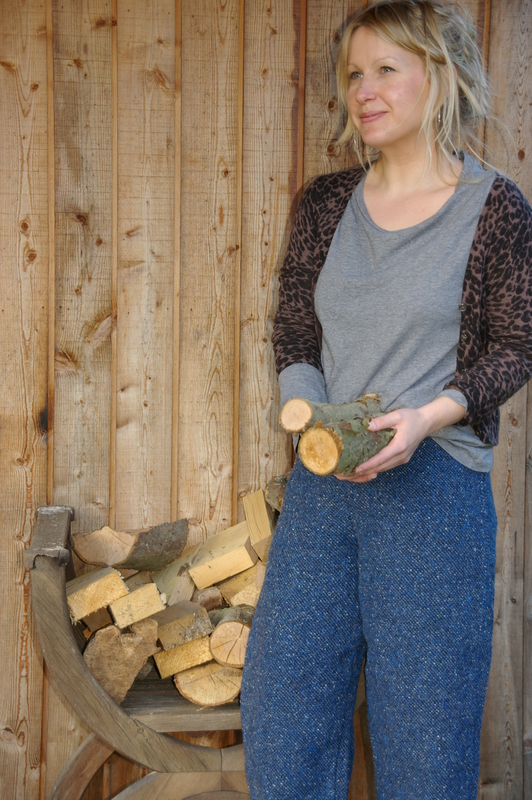 This is my lovely daughter Pippa wearing a pair of wool tweed trousers woven on the Ashford 20″ Knitters loom. You need to weave two separate lengths ( one for each leg!) but it is a nice balanced weave and grows quite rapidly and the pattern fits on the width of the fabric just perfectly. This is Sarah’s niece Sara, who was also our model for our first book Simply Woven, self published in the ’90’s. She is just as beautiful now as she was then. 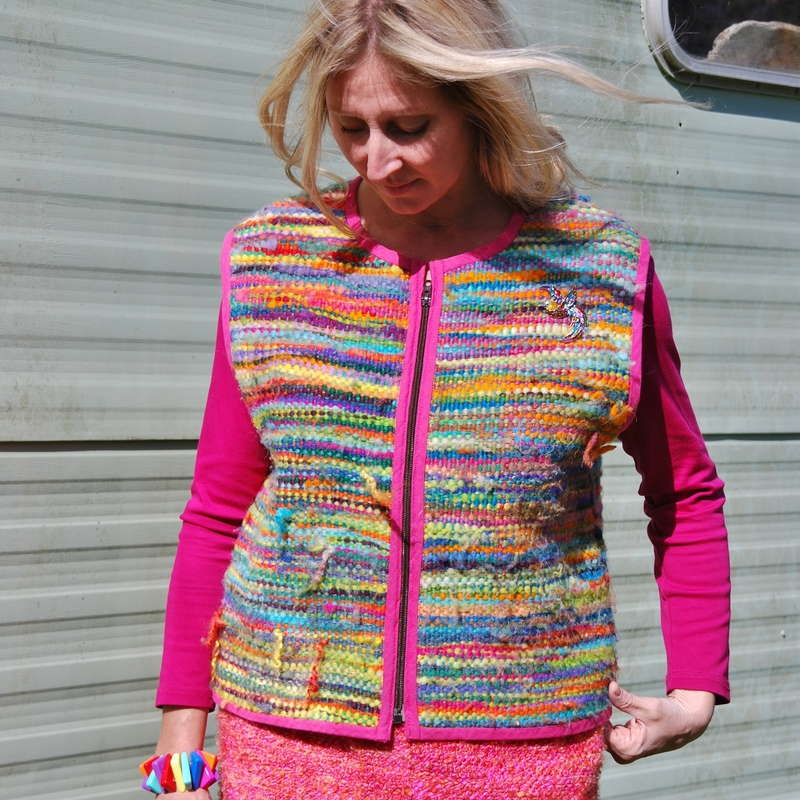 She is wearing a wonderful body warmer made entirely of sheeps fleece that has been rainbow dyed. The locks are tucked into the warp as you weave allowing them to show all their woolly attributes. This makes a very light and flexible fabric which is then easy to sew and lovely and cosy to wear. This was made on a 16″ rigid heddle loom. Of course it does help if you can find sheep the right colour! These live on a farm in Stock and belong to our dear friend Sue, weaver of the lovely full length coat. Her breeding programme is top secret as you will understand. http://www.norfolkyarn.co.uk They are in Pottergate, Norwich, Norfolk. Also from http://www.magpieandme.co.uk They are on Market Hill, Framlingham, Suffolk. Also from http://www.threshingbarn.com They can be found in Fairfield Mill, Sedburgh, Cumbria. We shall be having a stand at WONDERWOOL in Wales in April and also FIBRE-EAST in Bedfordshire in July so do hope to meet up with some of you then. Sue from Stock, I should like your readers to know that no sheep was put under any stress during the production of your book. I do love the new book ,and am already spinning yarn to do my next weaving project, getting my ideas straight from GET WEAVING.